Each week Swanson Meats produces thousands of pounds of steaks, and with each and every cut we pride ourselves on our craftsmanship and butcher-shop traditions. Our professional butchers create hand crafted masterpieces offering our customers unmatched consistency and quality. 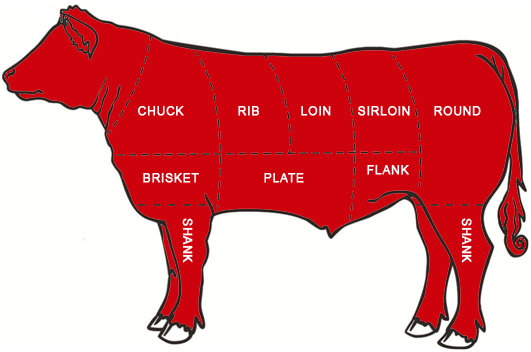 We start with mid-western corn fed beef sourced from our industry’s premier suppliers. We then age our beef primals for a minimum of 21 days to ensure robust flavor and tenderness. Next, our professional butchers hand cut your steaks to your specifications. Consistency is key. Next, your order is staged for packaging according to your specifications, whether you prefer individual or bulk packaging. Lastly, your order is loaded onto our temperature controlled trucks and conveniently delivered to your restaurant. We’ve designed our portion cutting program with our customers in mind, focusing on quality, consistency, safety, and affordability. We would love to demonstrate the quality and consistence of our products. Schedule a cutting today, we’re confident we will exceed any and all expectations! Meyer Natural Angus operates the largest working ranch in western Montana which is made up of more than 40,000 acres. Cattle are raised naturally the way nature intended, resulting in exceptional juiciness, tenderness and flavor. With a 100% natural process cattle roam on spacious pasturelands, where they are fed a 100% natural diet and are allowed to mature. Cattle are never given hormones or antibiotics. All cattle are sourced and aged verified back to their ranch of origin. 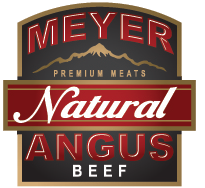 Meyer Natural Angus is premium quality beef that is graded USDA Choice and Prime. Meyer Natural Angus is also Certified Humane. Revier Cattle Co. is our premium line of locally sourced all natural Black Angus Beef. Revier cattle are raised in Olivia, MN on a 150 year old family farm. They are committed to unmatched sustainability and producing the best tasting Black Angus Beef using old fashioned proprietary feed. Only the best Black Angus bloodlines with unique northern genetics are developed with no expense spared to achieve the highest quality beef. Certified Premium Beef is superior in quality and taste with higher levels of juiciness, tenderness and rich flavor. This Upper Choice brand delivers the marbling, trim and taste that chefs, retailers and gourmets prefer. 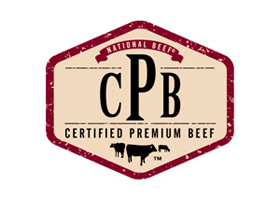 Certified Premium Beef is a USDA Certified program that contains Upper Choice graded beef. Program consists of Mid-west grain fed cattle with an overall A maturity.